The cumulative effect of the clear correspondences between Othello and Oxford’s documented life experience is really extraordinary. There’s no better way to get a deep understanding of a Shakespeare play than to have to read everything written about it and then organize commentary on it. It was a great adventure working with Ren on this edition. Ren Draya said, “We look forward to hearing responses from readers and hope that our Oxfordian Othello opens new avenues of investigation.” Draya has allowed SOS News Online to publish her remarks on editing Othello that she originally delivered as part of her presentation,“The Dramatist’s Knowledge of Music as Shown in Othello” at the Shakespeare Fellowship and Shakespeare Oxford Society 2009 joint annual conference in Houston, Texas: please see “Editing Othello” by Ren Draya. 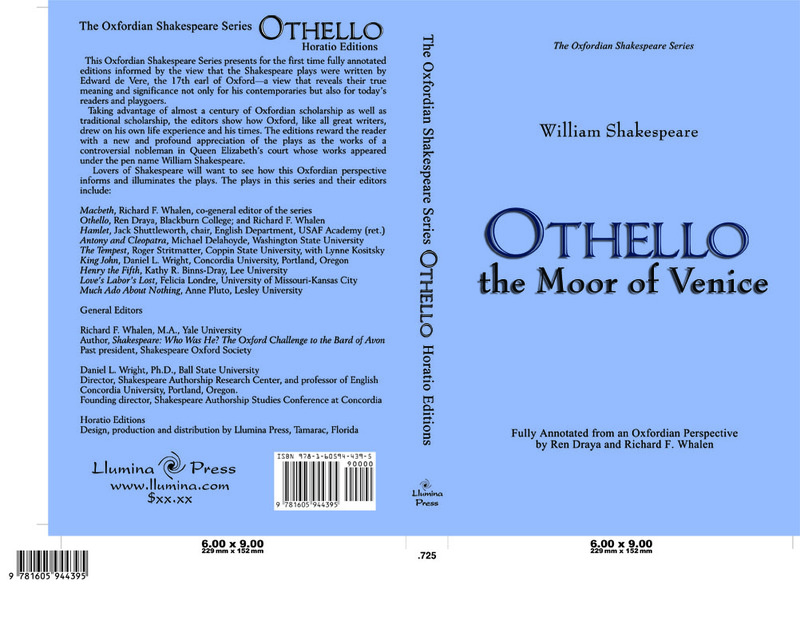 The first Oxfordian edition of Othello, edited by Ren Draya, professor of British and American literature at Blackburn College, and Richard F. Whalen, co-general editor of the Oxfordian Shakespeare Series, has been released by the publisher, Horatio Editions – Llumina Press. Informed by the view that the seventeenth Earl of Oxford wrote the Shakespeare plays, this edition of Othello has drawn on the extensive research and writings of Oxfordians and Stratfordians to describe the many correspondences between the play and the life of Oxford. Several of the most significant correspondences will be new to many Oxfordians. In the introduction to the play and generous line notes, the editors examine how the play reflects the dramatist’s knowledge of the aristocracy, court life, the military, music, the Italian language, and the government and topography of Venice and Cyprus. A major influence on the play was commedia dell’arte, at its height in Venice when Oxford was there but unknown in England; another strong influence was Oxford’s concern for his reputation and abhorrence of the specter of cuckoldry. In the appendix are articles on the significance of the music in Othello by Draya, on the dramatist’s unusual knowledge of the port of Famagusta on Cyprus by Whalen, and on Stratfordian scholars’ recognition of the dramatist’s in-depth knowledge of military command. The general editors of the Oxfordian Shakespeare Series, published by Horatio Editions—Llumina Press, are Whalen and Daniel L. Wright of Concordia University in Portland, Oregon. The first in the series was Macbeth, edited by Whalen. Forthcoming in the series, and their editors, are Antony and Cleopatra, Michael Delahoyde of Washington State University; Hamlet, Jack Shuttleworth, English department chair (ret. ), U.S. Air Force Academy; The Tempest, Roger Stritmatter of Coppin State University, with Lynne Kositsky; Henry the Fifth, Kathy R. Binns-Dray, Lee University; King John, Daniel L. Wright, Concordia University, Portland, Oregon; Love’s Labor’s Lost, Felicia Londre, University of Missouri-Kansas City; and Much Ado About Nothing, Anne Pluto, Leslie University. This essay on preparing an Oxfordian edition of Othello was first presented by Ren Draya, PhD, as part of a talk entitled “The Dramatist’s Knowledge of Music as Shown in Othello” at the Shakespeare Fellowship and Shakespeare Oxford Society 2009 joint annual conference in Houston, Texas. So, this business of editing Othello — well, I survived! And the book is available from Llumina Press. How did it all start? Richard Whalen, a most persuasive and tenacious Oxfordian, asked me in the cafeteria of Concordia University in April 2005 if I’d be willing to tackle the project. Bedazzled by his Irish charm, I agreed. I had no idea it would stretch into a more than four-year-long endeavor. Initially, I re-read the play, looked through all my files, and started collecting various editions of Othello. Editing an entire play involves three components: working on the play text, writing an introductory essay, and preparing line notes. Getting a copy of the play text on my computer simply meant a download from MOBY on June 9, 2005, which was done by the computer whiz at Blackburn College. Most of the work for this project was done in my very pleasant office at Blackburn College. As you might guess, teaching full-time or being committed to any full-time job, does not fit in well to a mammoth task such as editing a Shakespeare play. About 90-percent of my work was done during holiday times, occasional weekends, and the long summer breaks. I wrote the first draft of the introduction in August 2005 and sent it off to Richard Whalen and Dan Wright. Richard became the main communicator — except that we discovered my Macintosh wasn’t always on speaking terms with his PC. There were initial difficulties with the computers not communicating effectively (or at all) with each other. Because there was no common word-processing program, line numbers did not match up. With help from my students and professional technical advice, the problems were eventually resolved. I also received help from the college library staff, who sent for all sorts of material via inter-library loan from JStor. Chronicle of Higher Education reporter Jennifer Howard writes an unbiased presentation of the reasons Shapiro wrote Contested Will, and the state of authorship politics including quotes from Shakespeare Fellowship President Earl Showerman and prominent anti-Stratfordian researcher Roger Stritmatter. 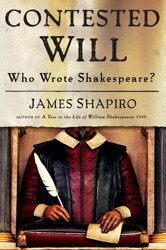 “A Shakespeare Scholar Takes on a ‘Taboo’ Subject: James Shapiro explores the authorship question — and why few in academe will touch it” by Jennifer Howard in The Chronicle of Higher Education, March 28, 2010.
Review of James Shapiro’s Contested Will: Who Wrote Shakespeare? “The Shakespeare Whodunit: a scholar tackles doubters on who wrote the plays; Hollywood weighs in” by Alexandra Alter, interview of James Shapiro in Wall Street Journal April 2, 2010. Peter Conrad reviews James Shapiro’s Contested Will in The Observer, April 4, 2010. Jeremy Noel-Tod reviews James Shapiro’s Contested Will in The Telegraph, April 4, 2010. Heward Wilkinson’s “De-imagining Imagination” essay on James Shapiro’s Contested Will, April 4, 2010. “Will uncontested” no-byline review of James Shapiro’s Contested Will in the London Times, April 5, 2010. Contested Will author James Shapiro published an essay titled, “Did Shakespeare write his plays alone?” in Sunday’s London Financial Times dated March 26, 2010. It emerged that scholars who had been preparing the editions on which the rest of us depended had not made clear the extent to which their texts of some major plays were stitched together, often arbitrarily, from different quarto and folio versions that had come down to us from Shakespeare’s day. This news was hard to absorb. Surely you couldn’t just pick and choose which bits you liked from each version? Yet that is exactly what many editors had been doing. As a result, texts would now have to be unedited to make clear how early versions of the plays differed, and to discover where Shakespeare may have had second thoughts and revised his plays. The revolution only went so far. Those transforming Shakespeare studies were rigorous in challenging outmoded ways of thinking about Elizabethan drama, but failed to address the persistent belief that somebody other than Shakespeare might have been the true author of the works long attributed to him. Maybe they had no reason to take such a claim seriously. But there’s an alternative worth considering: that when it came to the question of authorship they weren’t ready to confront some shaky biographical assumptions, assumptions they held in common with Shakespeare-deniers they viewed as cranks.
. . . that the plays and poems are autobiographical. To believe this is to accept that the plays are not (or not merely) imaginative creations but also recycled chunks of an author’s life. These two faulty assumptions are twins since collaboration precludes representation of a single artist’s biography according to Shapiro’s essay. Since the 19902 the ranks of those who doubt that Shakespeare was the true author of his plays have grown. Prominent actors including Mark Rylance and Sir Derek Jacobi have joined those promoting alternative candidates, especially the Earl of Oxford. And it was recently reported that the director Roland Emmerich is shooting a new film, Anonymous, which should popularize the case of Oxford . . ..
Maybe this challenge will be enough to get scholars to repudiate the last, most cherished Shakespearean anachronism, one that not even the radical scholarshp of the past 25 years had dared question: Shakespeare, the autobiographical artist. As I understand it, Shapiro’s goal is to devastate authorship queries by fragmenting the artist with studies on Shakespearean collaboration, and by denying that an artist reveals his biography in his works. If by “biography”, Shapiro means an artist’s use of actual events in his life, I am willing to make that concession that not every artist writes his life story in his work in the fashion of Arthur Miller or Neil Simon. I agree, not because Shapiro is correct in his notion that an artist expressing his “biography” is a nineteenth century development — but because that materialistic notion of biography is not the idea that most threatens the Stratfordian convention of authorship. An organic notion of biography, on the other hand, is devastating to Stratfordians. An organic biography begins with a time and place of birth and continues with an individual’s awareness filtered according to his own particular biological gifts and individual opportunities for understanding and action. An organic notion of biography cannot be dismissed as a mere cultural fabrication, nor can the effects of an artist’s organic biography be erased from any human creation. Maybe this artist has given us no “life-writing”, but never say this artist has written nothing about his life. 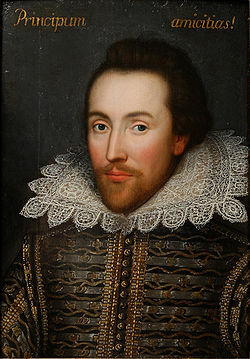 Although those who question the attribution of Shakespeare’s works may be physically, emotionally, mentally, morally, psychically, and/or socially maimed, deficient, ignorant, damaged, ill, and/or deluded as Shapiro has explored in Contested Will; it is not pathology that drives this query. It is the simple, human, biological, biographical curiosity to know how this great art came to be created. The answer from Stratford is tongue-tied silence. Philadelphia Inquirer staff writer John Timpane wrote an interesting article about the addition of Cardenio/Double Falsehood to the Arden Shakespeare series, “The stamp of Shakespeare’s on it: A play bearing much of the Bard” dated March 23, 2010. Timpane gives a clear and nuanced account of the complex situation regarding the Arden editors’ addition of Cardenio/Double Falsehood to the canon. The convoluted story makes the addition seem so pointless that a reader might be forgiven for wondering if there might be a political motive for adding seventeenth-century, collaborative material to the canon. Timpane’s experts sliced Shakespeare so fine it hardly seemed to matter who this pathetic collaborator might actually be. Michael Dobson, professor of Shakespeare Studies at Birkbeck College/ University of London wrote a review of James Shapiro’s Contested Will: Who Wrote Shakespeare? that was published yesterday in The Financial Times. Contested Will is a terrific read, but fully explaining the authorship controversy isn’t a job for a Shakespearean scholar: it’s a job for a pathologist. Shapiro does not waste words on the preposterous, but he does uncover the mechanism of fantasy and projection that go to make up much of the case against Shakespeare. The Guardian chose to illustrate Mantel’s review with a version of the pretty-boy Shakespeare in sumptuous lace collar. Everyone has latched onto this new visual version of the Bard, as if replacing that boring old Droeshout from the First Folio somehow soothes our fractious nerves. John Carey reviews James Shapiro’s new book in London’s The Sunday Times, dated March 21, 2010: “Contested Will: Who Wrote Shakespeare? by James Shapiro — A devastatingly funny look at the many attempts to reveal who “really” wrote Shakespeare’s works”. The Baconian and Oxonian allegations, if true, would have entailed a huge cover-up, and modern willingness to believe that it really happened is cognate with the belief that Princess Di was murdered or that the moon landings were fake. They all stem from the conviction that governments are corrupt and secretive and that we are kept from the truth. Conspiracy theorists are prone to resist rational argument, regarding it as a tool of the authority that they distrust. So Shapiro’s book is unlikely to cut much ice with Oxonians. All the same, it deserves to. It is authoritative, lucid and devastatingly funny, and its brief concluding statement of the case for Shakespeare is masterly. By Oxonian, Carey means those who like Oxford as Shakespeare. I think this is a new use of the noun. Previously one had to live in Oxford, or to attend or to have attended Oxford University to be so designated. I don’t think it’s a good use; too confusing. An article by Sarah Knapton that appeared in the London Telegraph yesterday (dated 20 March 2010) throws doubt on the newest “Shakespeare” portrait: “William Shakespeare portrait could be 16th century courtier: A portrait believed to be the only surving portrait of William Shakespeare painted in his lifetime could be the 17th century courtier Sir Thomas Overbury, an expert believes”. The Jacobean painting from the family collection of art restorer Alec Cobbe was thought to be the bard because it closely resembled the engraving in Shakespeare’s First Folio. It is also noticeably similar to another painting believed to be the playwright owned by the Folger Shakespeare Library in Washington, DC. But now experts believe the elaborate lace collar and gold embroided doublet are too grand for the playwright. Dr Tarnya Cooper, the sixteenth-century curator at the National Portrait Gallery in London, believes the portrait bears a greater likeness to Sir Thomas Ovebury. She told The Times: “if anything, both works, the Folger and Cobbe portraits, are more likely to represent the courtier Sir Thomas Overbury”.